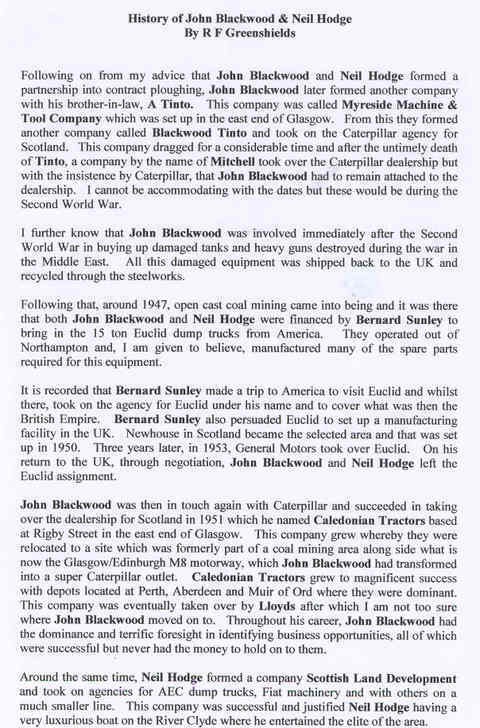 3 entries categorized "A COMPANY HISTORY"
THE NAME IS FAMILIAR, AT LEAST THE SURNAME, AND TO BE FOUND BELOW ARE A COUPLE OF MESSAGES FROM HIS GODSON, MR LESLIE MORRISON, WHO HAS KINDLY FURNISHED US WITH THEM TODAY. ....and after having made contact with Mr Morrison, he kindly gave us permission to publish his messages in the following e-mail. WE HAVE SOME MORE INPUT REF BH HISTORY, BASED MOSTLY AROUND NORTHAMPTON, THIS TIME WITH THE KIND PERMISSION OF AN AUTHOR FROM DUSTON, NORTHANTS, MR J.W.F. (FRED) GOLBY. MR GOLBY IS A LOCAL AUTHOR OF GREAT REPUTE WHO HAS WRITTEN MANY LOCAL BOOKS, BUT THE REFERENCE THAT HE HAS KINDLY ALLOWED US TO QUOTE COMES FROM ONE CALLED "THE IRON ORE FIELDS OF NORTHAMPTON FROM 1855-1921". What does that have to do with BH you might ask ? Well, the "Hunsbury Hill Ironworks" is the site that Bernard Sunley bought to start the Company, an address that most of you know better as "Hunsbury Hill Avenue". Mr Golby`s books can be bought from Golby`s Garden Centre, in Duston, and thoroughly recommended they are, because they contain photos of Northampton yard in the 1940`s, when BS started the works there, still with the big chimney standing, and prior to any involvement with Euclid, but then with a few in the very early 1950`s, with the many of the old buildings, but with some of the new. We cannot reproduce those photos at present due to copyright etc, but one day, who knows !! JUST IN FROM R.F. (BOB) GREENSHIELDS, IS HIS TAKE ON THE EARLY HISTORY OF THE TWO MEN THAT GAVE THEIR NAME TO THE COMPANY, AND WHAT HAPPENED TO THEM IN THE YEARS AFTER THEIR INVOLVEMENT WITH BERNARD SUNLEY. 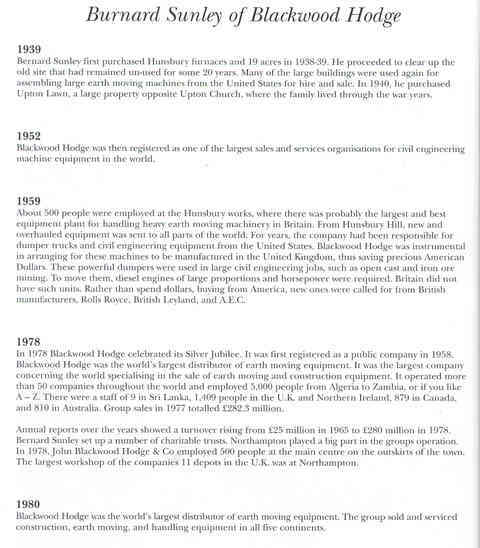 Bernard Sunley & Blackwood Hodge…..entrepreneur, building contractor, earthmover, and one of the most famous company names in post war construction sales history, are synonymous in the mind of many people who worked at The Company from the early post war years to the late 1960`s. His early business history is not written in detail anywhere*, but it is thought to be based around pre-war activities with his company Landing Grounds Corporation Ltd, which as its name suggests, was heavily involved in the construction of airfields for the still relatively new business of commercial and private flying. During WW2, the pattern continued, but obviously for other reasons, ie, bomber & fighter bases. It was in the late pre-war period that a name that was to figure large in the post-war years came into contact with Bernard Sunley, that of EP (Eddie) Beesley, who must have been in his teens when he first worked for him, and after serving in the 8th Army during the conflict, returned to Blackwood Hodge employment in 1945. 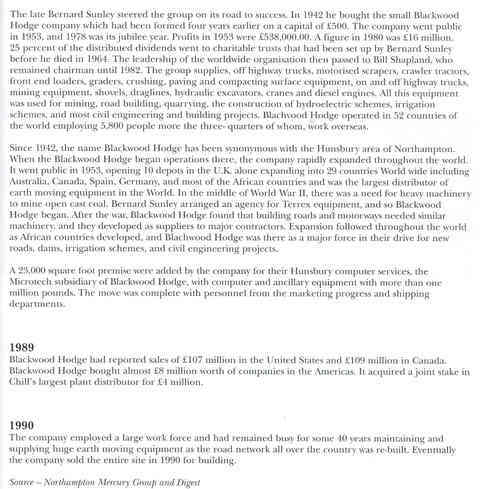 1938: John Blackwood Hodge & Co was formed through a partnership of John Blackwood & Nial Hodge with £500 capital, and was possibly a small construction company involved in house building. Not much is known about John Blackwood, but it is thought that he was a gentleman farmer with money, possibly from Scotland*. Nial Hodge was a plant man* it is thought, and is possibly the same Mr Hodge who was a co founder of the S.P.O.A. in 1950, although this man was listed as Niall D Hodge, of the then Scottish Land Development Corporation. 1941: The Company was purchased by Bernard Sunley (1910-1964), who had ambitions to expand above the ordinary housing market. 1945 onwards…… No dates available, but sometime during these years, the well known main BH depot on Hunsbury Hill at Northampton was purchased. It had been a small steel works (remember the water tower) thought to have been owned by Richard, Thomas & Baldwins, who had several ironstone quarries in the area, and nationally, who after being nationalized in 1951, became part of the Iron & Steel Corporation of Great Britain (forerunner of British Steel). Also around the early post-war years, with the Lease-Lend agreement still in full swing, construction machinery necessary for the rejuvenation of Britain was being imported, none less than the then largest truck available, the ubiquitous Euclid R-15, and Sunley, having used the machines already, was not slow in obtaining the agency to sell & hire this item, which must be considered as being the single most important move The Company made in the strides it took to eventually being one of the most famous and well known names in construction throughout the world. 1947-1953: With Britain recovering from the war, and “export or die” being the watchword, BH expanded rapidly with the help of experienced colonial administrators brought onboard throughout Africa, Asia, Canada and Australia, and by other means into Europe, with BH Belgium being the first agency in1953. By this time of course, the Euclid facility, owned by General Motors, had begun production in Newhouse, near Motherwell, and by now, several sizes of dumptruck, upto 30 ton, & tracked dozers, although the early twin powered motor scrapers and front end loading shovels were still a few years away. With these 2 companies moving in the same direction, success, although hard worked for, was almost assured in the burgeoning post-war domestic & overseas construction business. …… and here perhaps you can assist, send in your stories, pen-pictures, photos of anything and everything that were part of the rich heritage of a company that meant so much to an awful lot of people, for an awful long time, and help build up the complete picture of the name that struck fear into the reps of Cat, Michigan, AB and all the others who were not fortunate enough to work for BLACKWOOD HODGE.